Pictured here is a cow heart with some incisions to show the chambers and valves inside. 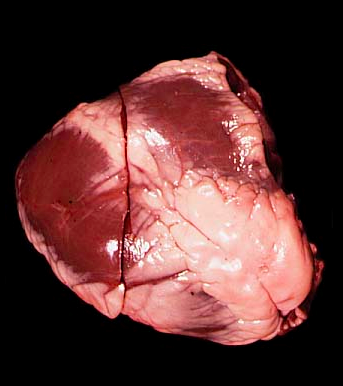 Note the amount of fatty material (light/white colored tissue) covering the surface of the heart. We will explore the cow heart because its larger size makes it easier to see the important and complex structures of the heart.